« The Olympics Are Coming! 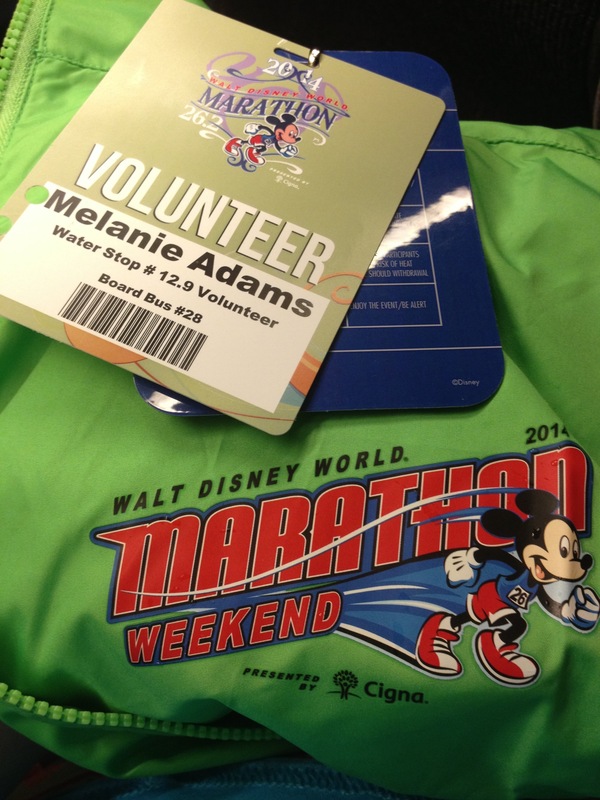 About a month ago, I headed down to my favorite place, the Walt Disney World Resort, to volunteer at runDisney’s Marathon Weekend. 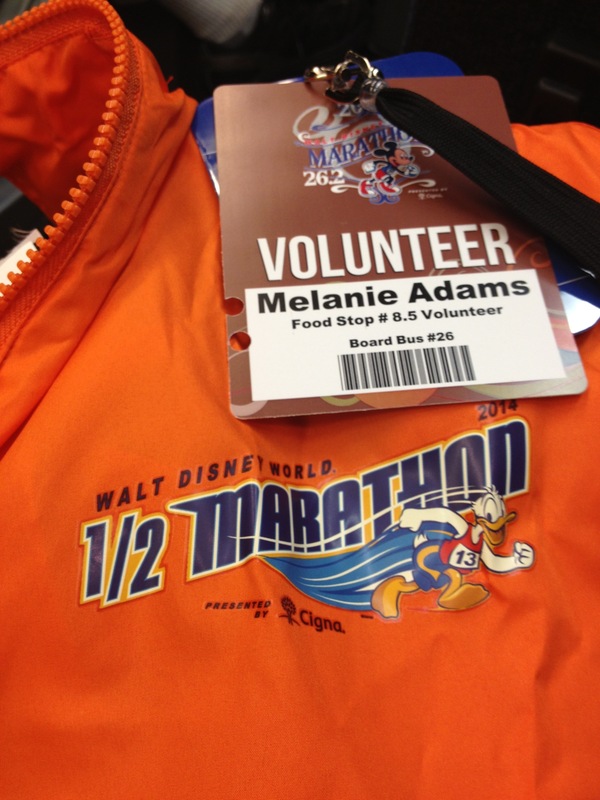 As you may know, I’ve participated as a runner in several runDisney events but never as a volunteer. Without the volunteers, the races simply would not be possible so I was excited to experience that side of it. 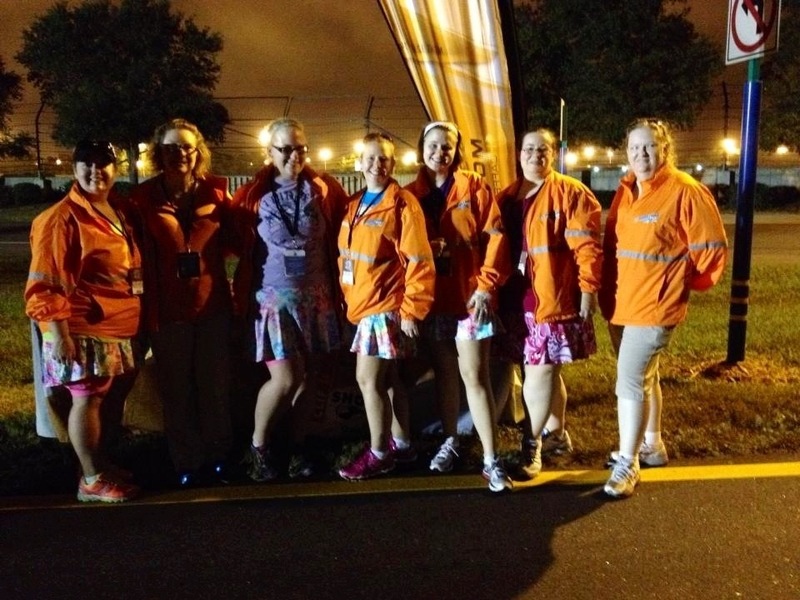 Volunteer registration for runDisney events is just about as popular as runner registration. Many events fill up within hours of registration so it takes some planning if you want to participate. Several of my friends and I wanted to volunteer together so when registration opened up, we were in communication with each other almost immediately so we could coordinate our requests. During the registration process, you actually choose what assignment you want and what location on the course. 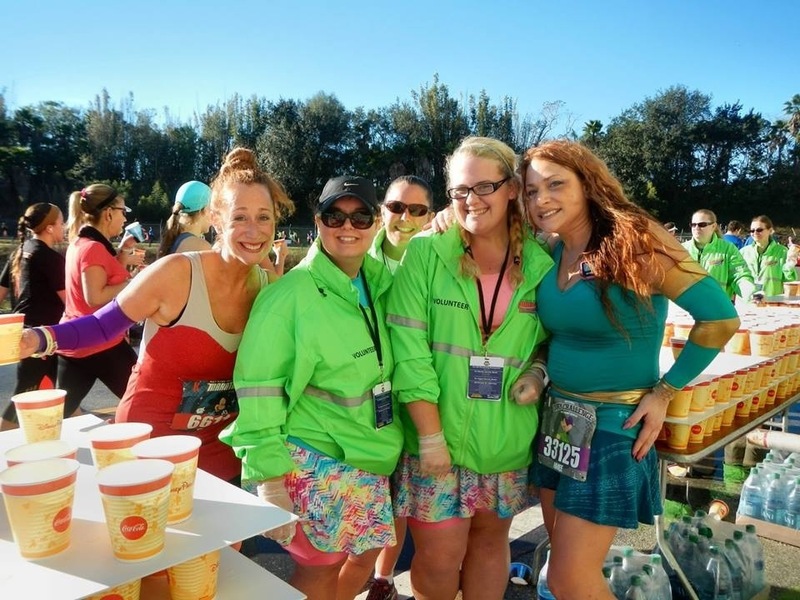 The assignments include bag check, screaming fan, water stops, food stops, and even volunteers helping to check volunteers in. My group chose the food stop for the half marathon, which was Clif gel and the water stop at mile 13.1 for the full marathon. For this event, volunteer registration opened up about 3 months prior. Assignments are not guaranteed so even if you register, your request is not guaranteed. In my group, we all got our requests, though. About a month before the event, I got a letter in the mail confirming my assignment and giving final instructions. We were also required to pick up our volunteer credentials prior to the event. For locals, runDisney had several options prior to the expo. Credential pick-up was also available at the expo for those from out-of-town. Since most of us were also running the 10k, we had to go to the expo anyway so expo pick-up was very convenient. My flight was delayed so my friend Heather ended up picking up my credentials for me. Both of our shifts were from 4 am to 11 am so we had to get up super early, 2:30 am. Transportation is not provided to the volunteer staging area so Heather drove us there. We left the resort around 3:30 for a 4 am arrival because we knew there would be road closures due to the race. The staging area was at the Blizzard Beach parking lot. When we got there, a huge tent was set up for volunteer check-in. We walked in, they scanned our credentials, directed us to jacket pick-up and then to snack pick-up. For snacks, we were each given a big Ziploc bag and were told to pick out 5 snacks. I got fruit snacks, Chex mix, an Uncrustables, a granola bar and some trail mix. Within minutes we were through the check-in area and headed to find our numbered bus, which matched the number on our credentials. In true Disney fashion it was all super organized and effortless. Around 4:30 am our bus took off for our assignment location. For the half marathon, we were stationed at the Clif gel stop, and there was quite a bit of setup to be done once we got there. Tables had to be set up, and we opened the boxes of gel. Everything had to be sanitized, too, and we were required to wear rubber gloves when handling the product. Once we got everything set up, there was a little time before the first runners were expected so a few of us walked to the Hess station right up the road. I was thankful for real restrooms nearby. Once the runners started getting to our area, everything moved very quickly. 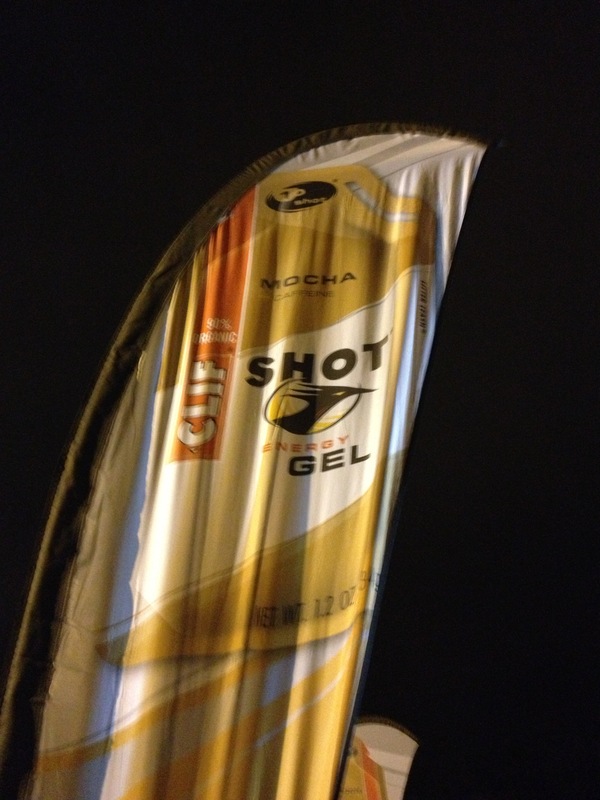 There was a little bit of a learning curve to holding the gel so the runner can grab it on the way by. It really only took a few hours for all of the runners to come through and then it was time to break everything down. Breakdown was a breeze and pretty soon it was time to get back on the bus to Blizzard Beach. Once we got back to the staging area, we had to be checked out just as we were checked in. Once again, our credentials were scanned, and we handed in our one day park ticket vouchers in exchange for the ticket. The next morning, we did it all over again. 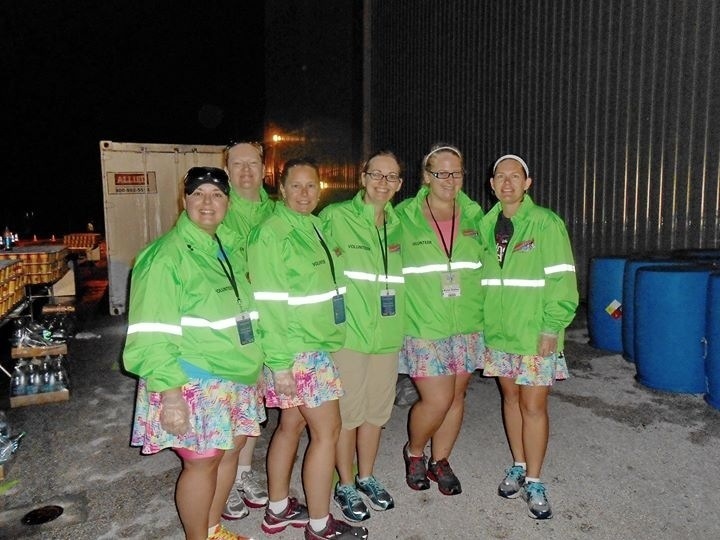 For the full marathon, we were stationed at the 13.1 mile water stop right outside of Animal Kingdom. In fact, we were right behind the Dinosaur ride building, and once the park opened, I could hear the sounds from the ride. Again, we had to set everything up including the tables and this time, pour the cups of water. Everything once again moved quickly once it started. 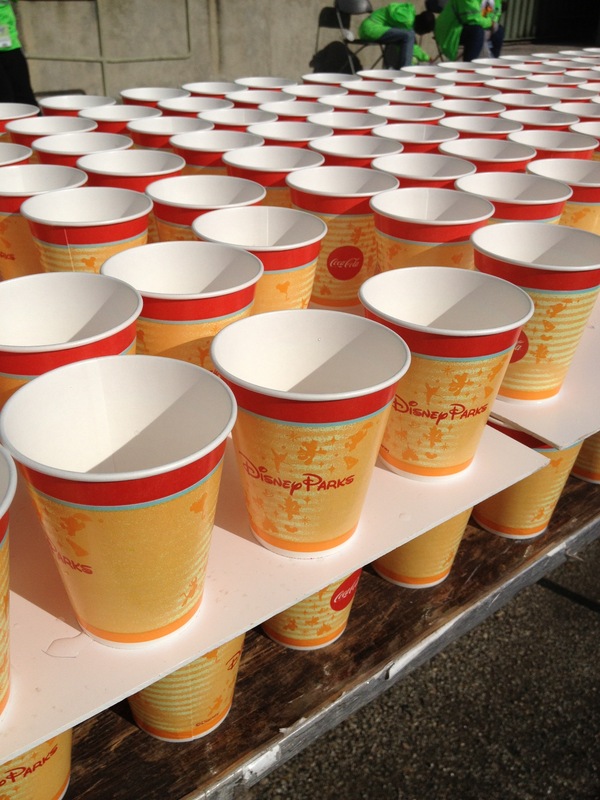 Again, there was a learning curve to balancing the cups on your hand so the runners could grab them. This part was tougher than I thought. Holding your arm out, balancing a cup of water on it for 3 hours straight was not easy. One of my favorite parts of volunteering was being able to see the race from start to finish. Runner interaction was great for both races. I also got to see all of my friends who were running, some of whom even stopped for pictures with us. 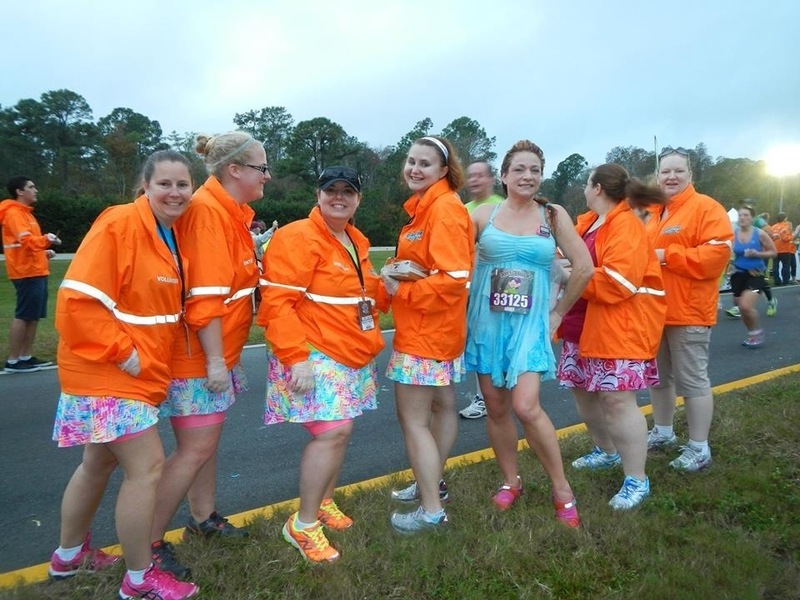 Our friend Aimee took time out of her race to stop for a pic with us. Day 2 Erica and Aimee stopped for a pic with us, looking great at the halfway point! I saw one of my sorority sisters from college whom I’ve not seen in 18 years! I also was able to spend quality time with some of my favorite running friends volunteering with me. I loved getting to know them better! As an incentive, volunteers always get snacks and a piece of apparel to wear for the shift, which you get to keep. In this case, we got jackets both days, and we were thrilled when we found out they were different for the different events. When volunteering for a half or the full marathon, volunteers also get a one day park ticket, so we each got two. What I was given doesn’t expire until March of next year so hopefully I can plan a trip between the time my annual pass expires and the time these passes expire to put them to use. I learned some things from volunteering. You’ll get dirty, much dirtier than I anticipated. The water stops are WET! Yes, that should go without saying, but I didn’t think to wear old shoes. About halfway through the second day I started calling out names on the bibs to give as many people as I could a little lift. The response from that was overwhelming! I wish I had done that from the very beginning. I had no idea what hard work volunteering was. Many runners thanked us, and yes, it felt great when they did. I was actually almost as tired and sore after volunteering as I am after running. Almost. Would I do it again? Absolutely!